At the heart of education theory is a widely used distinction between education and training. 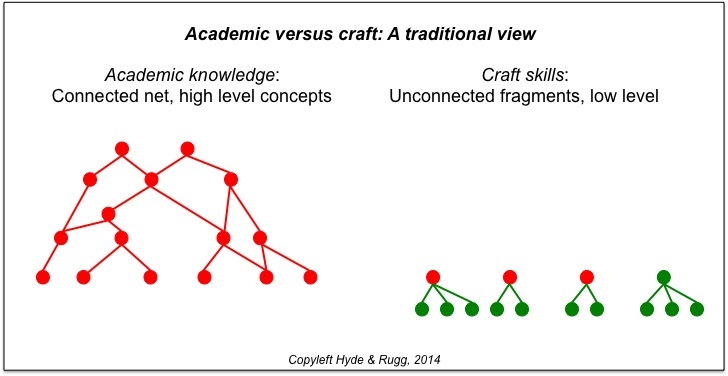 This overlaps with a closely related distinction between academic knowledge and craft skills. Although these concepts are extremely important, there is widespread debate about just what they mean, and what they imply for education theory and practice. In knowledge modelling terms, these two distinctions can be neatly represented using the concepts of closed sets versus open sets, and of connected graphs versus unconnected graph fragments. The illustrations below show how this works, and what some of the implications are for education theory and practice. There’s a useful distinction in set theory between a closed set and an open set, as shown below. A closed set is by definition closed; nothing new can be added to it. 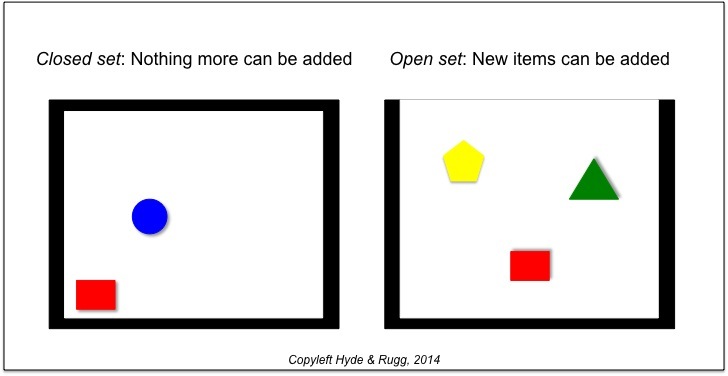 An open set is by definition open, and new items can be added. An example would be the distinction between the set of education papers published in 2013 and the set of education papers ever published. The first of these is closed, since 2013 has ended, and no more papers can be added to that set. The second set is open, and will remain open for as long as education papers are being published. This distinction maps neatly on to the traditional concepts of training and education. We can treat training as a closed set of knowledge, and education as an open set. So, for example, a particular module on a training course will be a closed set, where the student learns only what is in that module, and the student’s learning of that set of knowledge stops once the module ends. In contrast, a particular module on an education course should be an open set, where the student learns how to learn more about the topic, so that the student goes on learning about that set of knowledge even after the module is officially over. A related issue is the widely-used distinction between academic knowledge and craft skills. This can be modelled as shown in the figure below. According to the traditional view, academic knowledge is a formalised body of interconnected knowledge. Much of this knowledge is high level in the sense that it brings together more specific, lower-level concepts. For example, the laws of thermodynamics are unifying principles that join together a wide range of narrow lower-level specific facts, in the same way that the two red circles at the top of the “academic knowledge” diagram are the highest-level points that join together all the points below them. We’ve found these concepts very useful as tools for thought when examining the underpinnings of knowledge and learning. When they’re applied to actual cases, they produce some unexpected and powerful insights, which we will discuss in future articles. This entry was posted in craft skills, education theory, metalanguage, useful concepts and tagged academic knowledge, craft skills, education, training by hydeandrugg. Bookmark the permalink.